Happy Friday all! Today I'm bringing you a collaboration thats extra special to me. I've teamed up with the lovely Galia of Bonjour Monday, and she also happens to be my sorority sister! We both are proud alum of Arizona Aephi (LML). Not only do we have such great minds to join the same sorority (even if her decision came a couple years before mine) we both styled our graphic tees with leopard shoes. So whether you want to be casual with flats in sunny LA like Galia or spice it up with some high heels like me in Chicago, we've got you covered with two great ways to style your favorite graphic tee! To start off my graphic tee look, I put on my new favorite shirt. 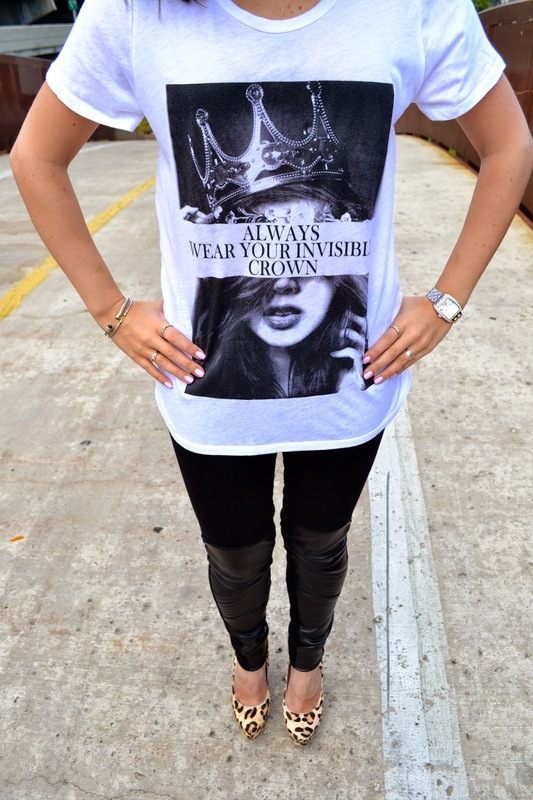 It says "always wear your invisible crown" and as a self proclaimed princess (thanks to constantly being called one by my entire family since I was a baby) this is basically my motto. It reminds me to stay confident in myself and be who I am. I paired it with my Rag & Bone skinny jeans with leather detailing and of course my Steve Madden leopard heels. You may remember these heels from our very first blog post (seen here). In my opinion, leopard is a neutral so they won't be leaving my closet any time soon. Be sure to head over to Bonjour Monday to check out how Galia styled her graphic tee and show her some love by following her on Instagram, twitter, pinterest and bloglovin. Have a fab weekend!